The lifeless bodies of five sperm whales have washed ashore on the eastern coast of Great Britain in the past week in what’s being called the worst sperm whale stranding in the UK since 1913. The stranding occurred just a week after a dozen animals of the same species washed up on German and Dutch beaches. 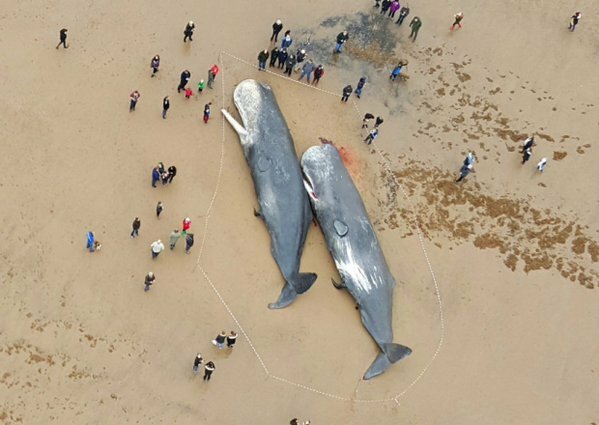 Three whales initially washed up on beaches in Skegness on Jan 23 while another two whales appeared a few days later about five miles up the coast. The whales attracted widespread attention, drawing thousands to the beach who were allowed to approach the giants before authorities cordoned the area off. Disgust mounted on social media when photos circulated of what looked like a man trying to remove the whale’s teeth as a souvenir. By Wednesday, three of the bodies had been removed by bulldozer and autopsies had been performed. Initial reports are that the whales entered the North Sea on accident and found the waters too shallow for feeding. Once they got caught in the shallows, the weight of their own bodies likely caused their internal organs to collapse. In performing the autopsy one of the whale’s reportedly exploded from the built up pressure of body acids, making it harder to obtain information.